It took eight years from 1892 to stabilize the product of cross-breeding the Oranda and the Ranchu. Shinosuke Matsubara, chief of the Fisheries School, named this goldfish by taking a character from the breeder’s name, which reads as ‘shu’ in Japanese. After WWII, it became extinct, however, the same cross-breeding process took place in different areas and numbers were recovered. Features Before it became extinct, its body shape was considered as ideal in that it did not have a dorsal fin like the Oranda. 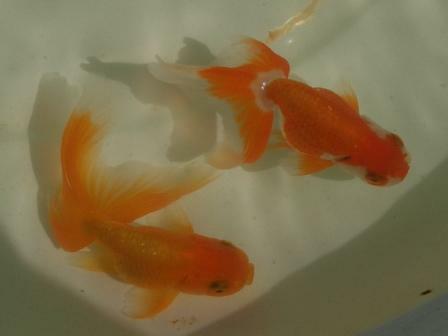 However, there is no such type of the Shukin today, and Ranchu with an elongated tail are typically called ‘Shukin’. Its body pattern is not only red but also a calico pattern (three colors). Acquisition difficulties Difficult. The Shukin has history indeed, but since it has been extinct once, it is a rather minor type of goldfish. Distribution amounts are low because it is not really popular. Somewhat difficult. It is not a strong type of goldfish and it is relatively difficult to rear. However, as long as basic rearing steps are followed, it will not easily die. Details of the above photo The Shukin in the photo is a goldfish bred at the Fukami Fish Farm in Yatomi, Aichi Prefecture. It is a pretty, one year old goldfish. There is a similar type of Shukin, called the Hagoromo Shukin. (The Hagoromo Ranchu is made by cross-breeding the Ranchu and the Koutou Shubun, and making the Haroromo Ranchu with an extended tail is the Hagoromo Shukin.) It was made at the Fukami Fish Farm.